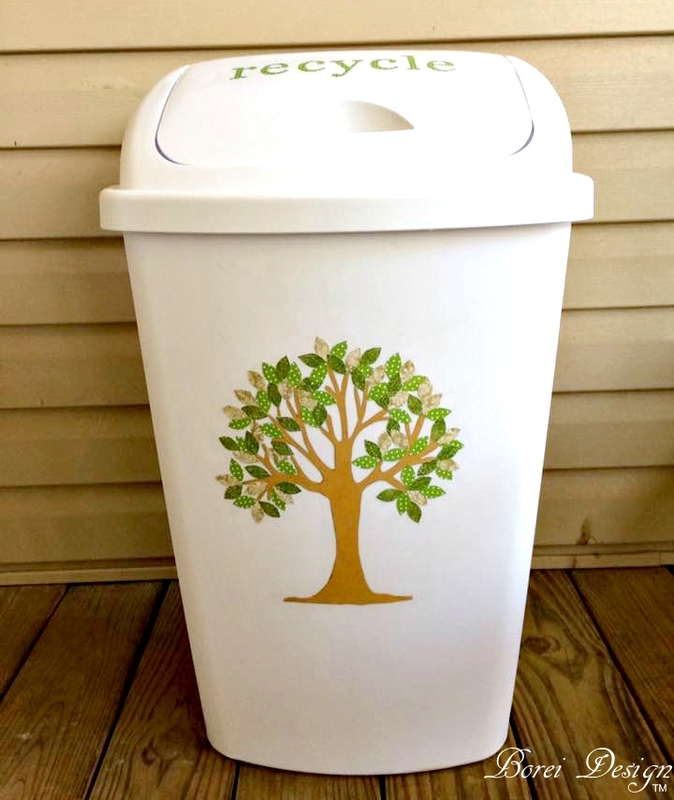 Easy DIY craft tutorial how to make an awesome decoupaged tree art recycle bin for the home from a standard garbage can using free pattern printable. If you have read my last couple of blog posts you probably already know that I'm still trying to recover from moving to a new city. It's been a total pain. However I was really psyched about one of the things my new city provides: an outdoor recycle bin that is the exact same size as my regular outdoor trash can! While I was a little bit perplexed as to why in the world they don't accept glass (seriously??? 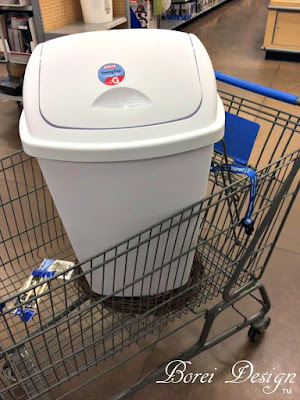 ), I was absolutely thrilled to find out that my new city uses recycle bins that are exactly like the regular garbage cans or carts you roll to the curb once a week! The city I lived in before gave out only a small, open crate that you had to sit outside beside your regular garbage can. It was not convenient or very helpful at all. When I saw the size of this baby sitting outside, I knew that it could dramatically increase the number of materials that we recycle from our home. 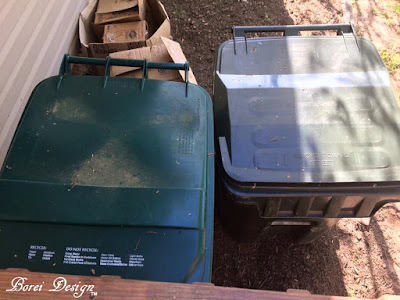 Then I got to thinking if my outdoor recycle bin is as big as my outdoor trash can, shouldn't the cans inside my kitchen be the same size as well? So I set out to find another trash can (or rubbish bin for my friends in The U.K.) to match the one my husband had bought a few days earlier. 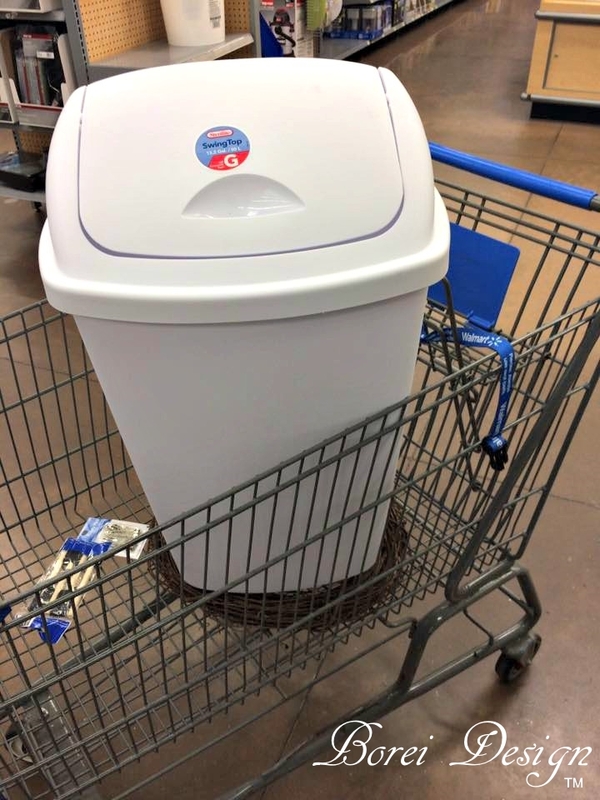 Thankfully it was just an average, inexpensive, regularly stocked trash can at Wal-mart and I was easily able to find the exact same one. I brought it home, placed it beside the trash can in the kitchen and informed my teenagers that trash went in the can on the left and recyclables went in the can on the right. How well do you think that worked out? Yeh. Exactly. They had it all mixed up. Fed up, I started brainstorming on a way I could solve the problem with a little style and here's what I did. First I printed and cut out the letters r-e-c-y-c-l-e from scrapbook paper. 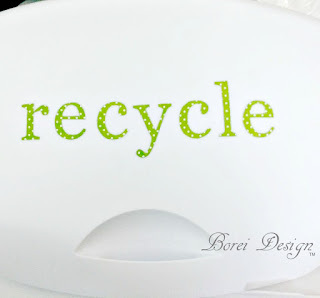 I decoupaged the word "recycle" on the bin lid using Mod Podge. 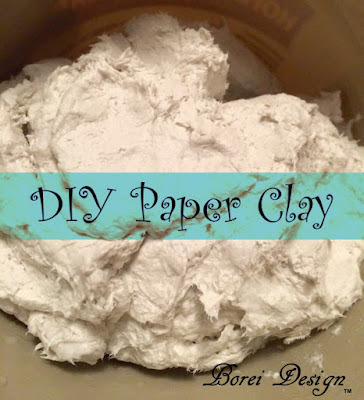 Mod Podge makes decoupage super easy. Just sponge brush a layer on the back of the letters, place them on the container as desired and allow to dry for about the 10 minutes. Then seal with another layer of Mod Podge on top and allow it to dry as well. Next, I drew and cut out a tree from brown wrapping/craft/shipping paper. 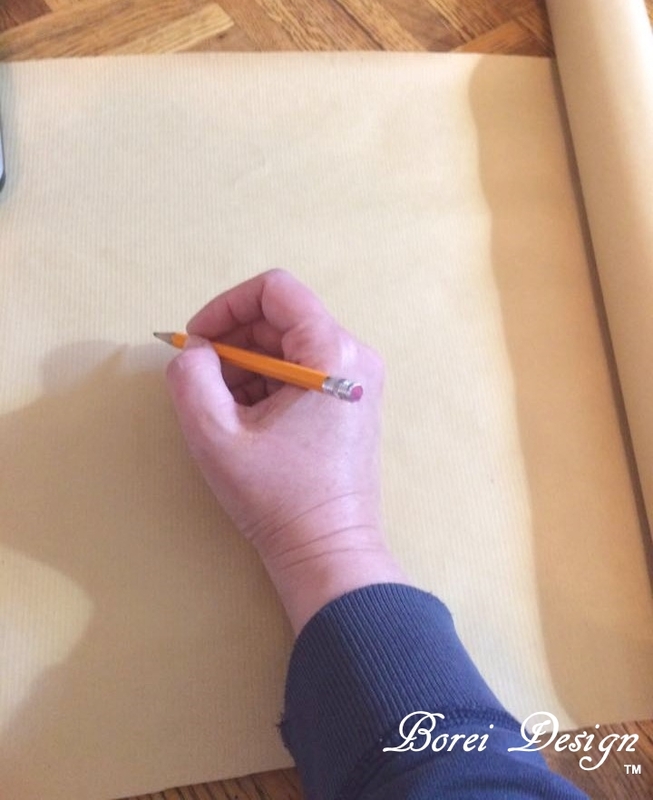 Don't want to draw your own tree? No biggie! I uploaded the pattern here. It is free for printing for personal (non-commercial) use for all my readers. Note: I didn't think to save the sheet I used for the lettering. 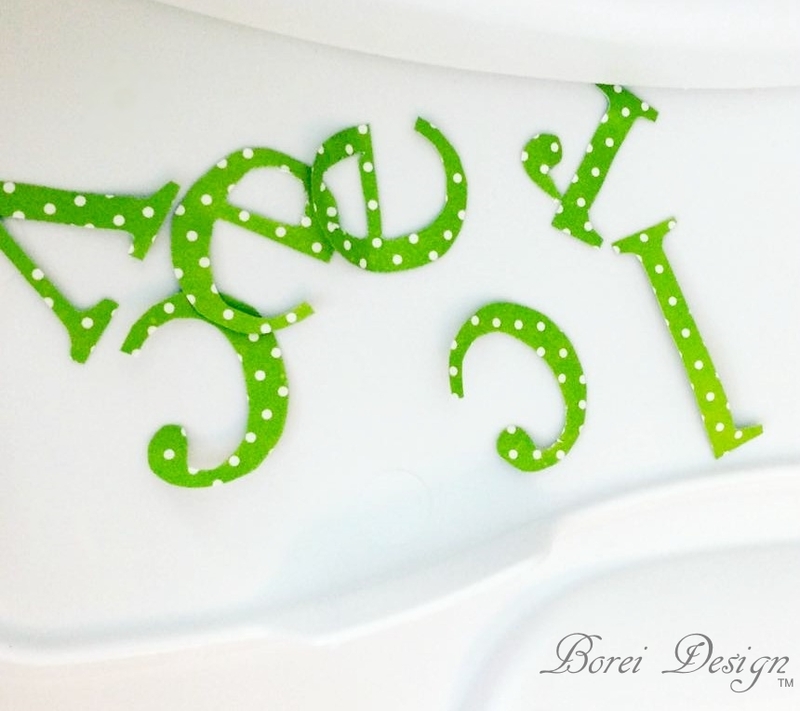 To make mine, I typed the letters on a word document, traced them unto scrapbook paper and cut them out with scissors. You can do the same or just use stencils from a craft store. If you have one of the programmable scrapbook paper cutting machines I'm sure that would do the trick as well. 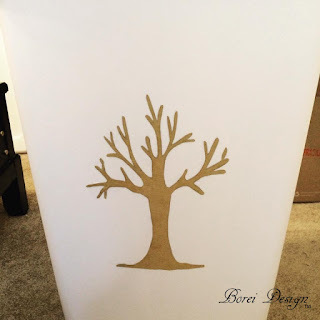 I decoupaged my tree cutout on the front of the container with Mod Podge. 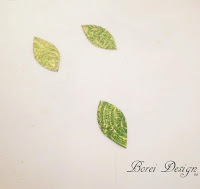 While the tree was drying I cut out lots of leaves using green scrapbook paper in different prints. I added and sealed the leaves to the tree with more Mod Podge and I was all done! I ended up labeling the other bin as "trash" using scrapbook paper and Mod Podge as well. Maybe (just maybe) my teenagers will be able to tell them apart now? 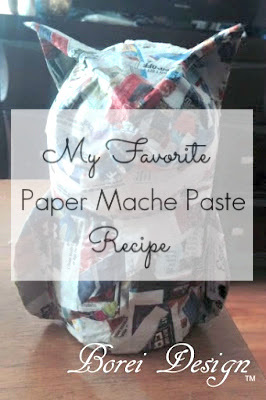 I hope you enjoyed this tutorial and happy recycling, my friends! 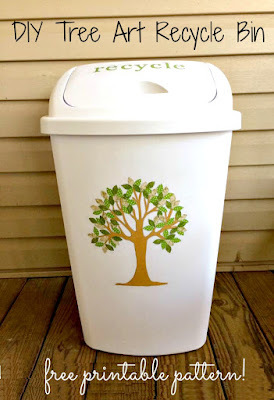 I love this idea to upgrade a plain white trash can. This will allow me to brighten up my kitchen with color and my favorite color is red. I am already choosing designs that are red for this one. Those came out awesome. I love how pretty you made them. I just love this look. I might have to decorate my boring looking trashcan. This is such a great idea! Easy to make too, perfect! Mod podge is the best. Teenagers are the worst. Lol. These look really great, hopefully your kids will be better recyclers now! Lol we can dream can't we?? That tree ended up SUPER cute! I love that it was so easy to do, too - hopefully it will work out well with the teens. I admire you for promoting the practice of recycling in your home. 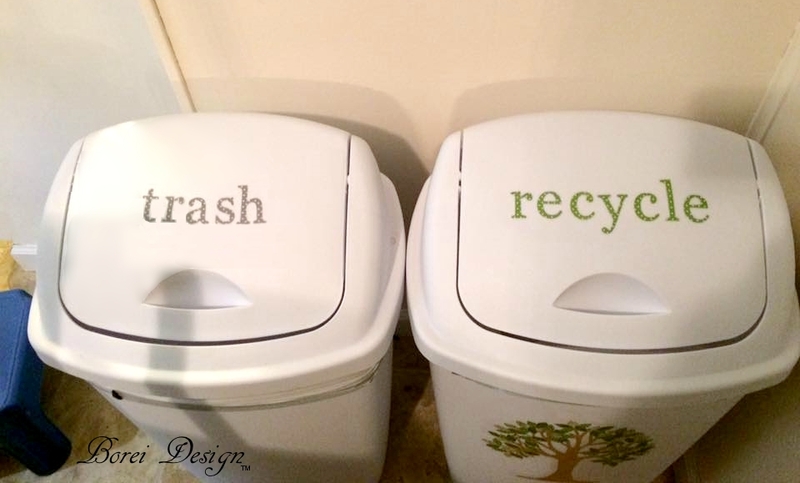 And labeling your trash bins, which are pretty btw, is super helpful. Everyone in the household will not have an excuse to not do their parts when it comes to recycling. Cute idea!! And easy to do. Thanks for sharing. What a cute idea and easy to do! Is the Mod Podge waterproof? Or do you need to put some type of sealer on top so you can wash the cans if needed without washing the beautiful lettering and designs off? LOL Good luck with the teenagers knowing the difference between the two bins! 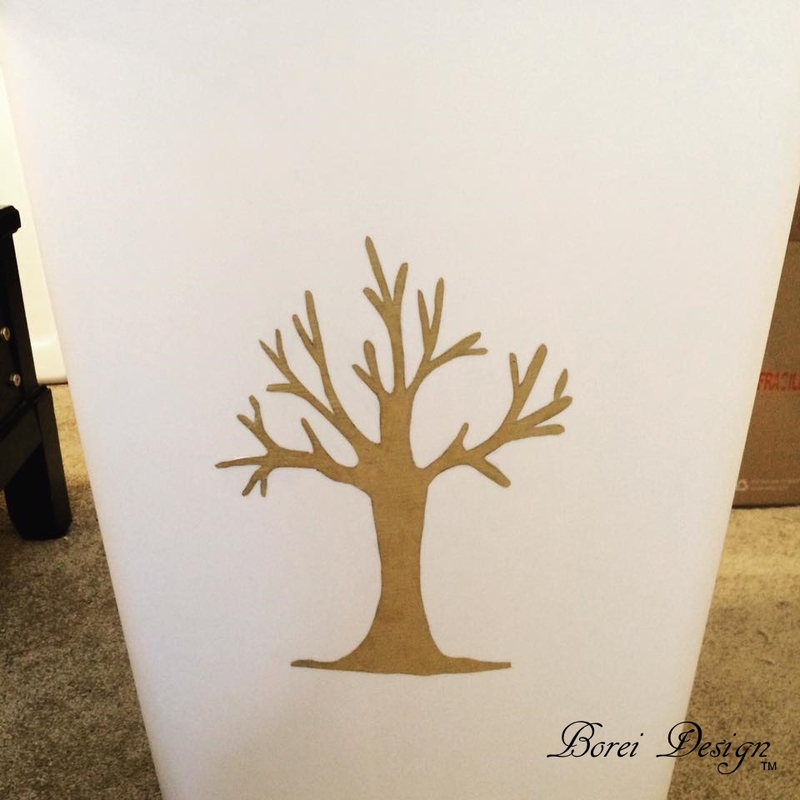 I honestly would have never have guessed that you decorated the bin yourself as the design looks so professional. I never realized how easy it was to make either! I really like the idea! It's so beautiful! Very cute bins! I think this would encourage kids to want to recycle too. The art you put on the trash cans was really cool. I would just feel badly doing all that work and then having the trash cans get very dirty. Looks awesome though. I love this idea. I bet it helps kids to recycle. I also bet they would love help making this. We always segregate our trash and this is really nice. Adding decor will help us determine which trash bin is for which! I love that you shared your pattern with us as well. This is a really nice pattern. It's nice that you chose to decorate it with a tree. I'd love to do this to my trash cans at home as well. Very cute! Thank you for the pattern and the ideas!!!! I just concluded recycle training at the local primary and elementary schools so I can help you with the "why no glass" question. Our local recycle center doesn't accept glass either. It is because there is no local company that will take it. Our local centers take in our items, do some initial sorting, compacting, etc then send it off to be completely broken,down and ready for reuse. You have to have a company ready to come get your products....if there isn't a local source the centers don't take it...where would they put it? What would they do with it? There are some really interesting videos on YouTube if anyone is interested. 😍 Be blessed and keep recycling.....saving the earth one plastic bottle or newspaper at a time. How neat! I could totally see myself doing this! I'll ahve to try it and let you know how it turns out! I've been using it on plastic for years. It works great! I love this! Our recycling can is actually way bigger in our city than our regular trash can, and both our inside trash cans are inside. And they're both white. So, I need to do this!